KBF, are you suggesting he looks kinda cramped in his kitchen den? Did you get my reference? It occurs to me not everyone would've heard Obama's victory speech last night. Yep, I got it... Bo does need another friend...Love the expression in T.'s eyes... he's great at dead panning!. Oh. Ha! Your brilliant comment went right over my head. Wait... about your second comment: are you talking about Louise's eyes? I think I have a post-election hangover. My neurons aren't firing! oops, yes louise.. thought tommy looked a bit different! lol... late night election did me in! Tommy's upstaged by Louise in this pic. He's lost in the kitchen. 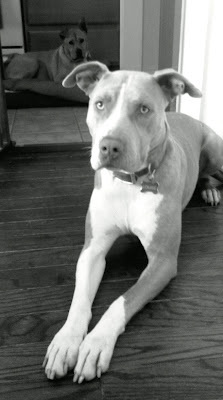 I think the white house needs a pit bull! What do you think, Tommy? All this time I thought u only had Tommy!. I never have the luck of a dog finding me!. Did Louise find you? I couldn't stay awake long enough. Now I have to go listen to the speech. 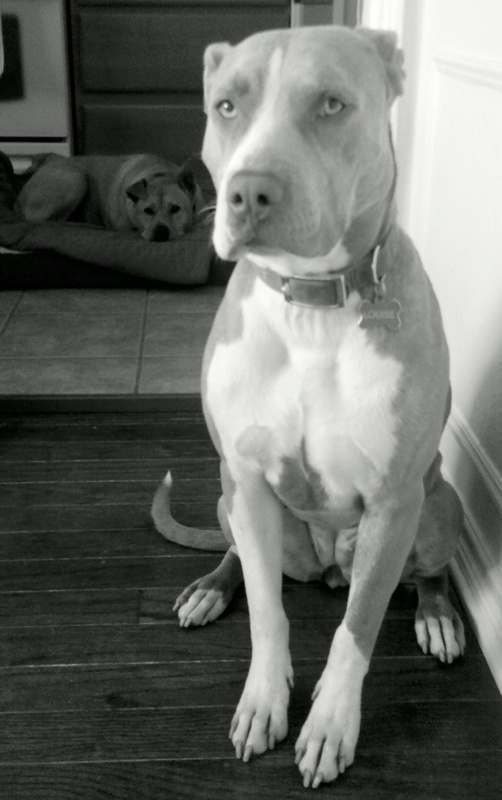 My Two Pitties, Tommy whole-heartedly agrees, although he's a little too rough around the edges to have the honor. KBF, I have that "luck" all the time! Louise and I found each other. Cafe, shhhhhh... I'm trying to convince myself. It's an insignificant reference in an eloquent, sweeping speech. But with a dog blog, I glommed onto it. One look at those faces and who could stop at one?!! Looks to me like you have one yes and one no, from Louise and Tommy. He does look very presidential. Jean, you make a good point (if I understand it correctly): Tommy would prefer to be the only mutt in the house. Sorry, Tommy. This is a two-dog house, just like Liz's. They're both pretty cute, aren't they, Shell? Margaret, I believe you're talking about Louise. She does look very presidential. 2016, yes? Hiker, the wall of Jerico comes down for brief, supervised moments. Baby steps. Kari, except in your world three dogs aren't enough. You guys are in a class all your own. Have u noticed I've updated my blog since Nov 7th? Cuz, I've noticed you haven't! Need something to write about, retired, or just tired??? Cafe, I have noticed you've updated your blog; I need to catch up on your posts. I have plenty to write about, not yet retired... definitely just tired! Thanks for dropping by to check on me. I hope to start blogging regularly again sometime in 2013. It seems like Tommy, who has to share his world with another dog, seems to think that Bo should have some company. At least on supervised occasions! Adele, Tommy would love to hang out with Bo. Bo and his humans might feel otherwise. No more dogs for you Missy.,. Turn around and walk away. I don't want to find you on some reality show for pit bull hoarders. Is Louise in this pic or you have another new dog? Wishing you and yours a Merry Christmas and a Wonderful New Year! Many hugs and kisses to you. Kisses to Tommy and Louise too. PS: For now, the book of Eduardo is not available in English. Thank you so much for your sweet wishes! Merry Christmas and Happy New Year to you, too! I hope your coming year is filled with much happiness. And thank you for letting me know about Eduardo's book. I hope it will be available in English someday. p.s. That is Louise in the forefront of this pic, and Tommy is in the background. I do not have another dog! PA, ha ha! No worries. No chance in hell I'm taking in another pittie or any other dog for that matter. I've reached my limit. Apologies to you both for this much belated reply. Time got away from me the past couple of months. Thank you for the good whishes and for your reply too! Yes, two dogs is so very good! One of the great things that occurred from doing my blog was meeting nice people like you! Happy New Year to the three of you, Susan.